Have you ever gone leap peeping? I have always loved autumn. And autumn and New England go together like peanut butter and jelly or tea and biscuits. If you happen to be in the U.S. in the fall, you should definitely take advantage of the amazing colour and light show going on here. New England is the northeastern most part of the United States. Massachusetts, Vermont, New Hampshire, and Maine are some of the most bucolic places to visit and will reward visitors with a friendly, colonial, and calm corner of America. When you think of this region, you think rolling green hills, white clapboard churches, coastal fishing villages, clam chowder and leafy college campuses. It doesn’t disappoint. And the autumn season here couldn’t be a better time to go and enjoy nature’s final fling before the snowy northeast winter sets in. Catching fall foliage at its peak can be a challenge as different weather patterns, temperatures, latitude, altitude, and length of daylight can all affect it. Typically the colours are most vibrant from late September to early to mid October — this shifts a bit of course depending on how far north or south you are. Go early and see the colours mixed in with greens, go later and see the colourful confetti on the ground, back lanes and in streams. The picturesque village of Stowe is most known as one of the best ski areas on the east coast. The village has great little shops, cafes and still exudes a relaxed small-town America feel. In the fall, the leaves in this quaint town turn brilliant hues of reds, oranges, and yellows. Add in the beautiful views of Mt. Mansfield (the highest elevation in the state) and long and winding roads offering pastoral scenes of church steeples and farms and it’s quintessential New England all rolled into one. This cute, quintessential New England town is most known as the home to Ivy League university Dartmouth College. With a total enrollment of 5,848, Dartmouth is the smallest school in the Ivy League. The main street of town is lined with little cafes and shops and leads right into the wide college ‘green’ where students lie in the grass or pass the time tossing frisbees about. For lunch, we tried Lou’s, a Darmouth institution since 1947 and Hanover’s oldest establishment. The vast White Mountains cover one quarter of New Hampshire with New England’s most rugged mountains. There is no shortage of activities from camping to hiking to skiing to canoeing. I flew through the air above the treetops on my second Zipline course with Alpine Adventures. We sailed over the red and yellow treetops on five different lines from platforms ranging in height between 15ft and 65 ft. It’s an exhilarating and free feeling that always makes me giddy with laughter. To come down from our zipline rush, we hiked the easy two-mile Gorge Trail in Franconia Notch State Park. The Flume Gorge is a natural wonder shaped over time by a wild stream that cuts through the granite to form a natural cleft with towering granite walls that rise 90 feet above. Beautiful, yet hard to pronounce, this winding road is locally called ‘The Kanc’. But unlike a bad canker sore in your mouth, this road was quite pleasant and delivered really beautiful vistas from beginning to end. It wasn’t paved until 1964 and cuts through the White Mountains from west to east. It only takes about an hour or so, even with requisite photo stops. 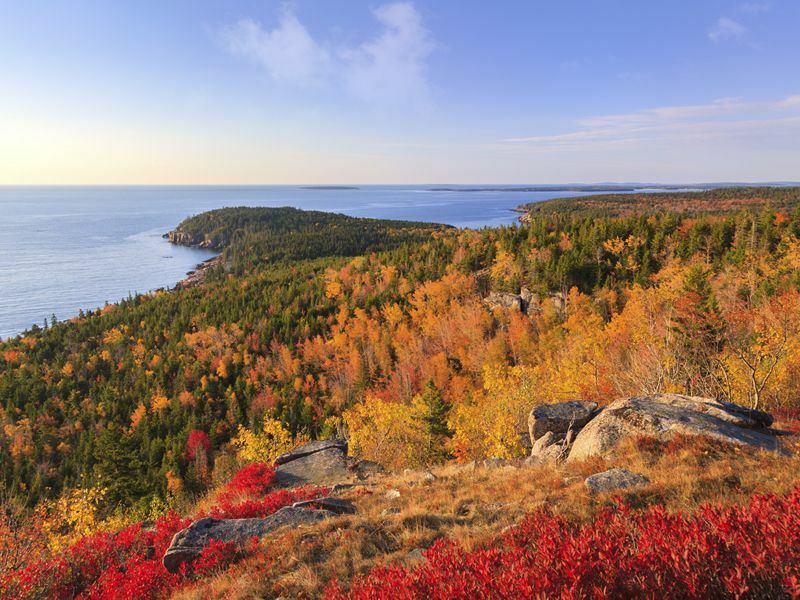 Surprisingly Acadia is the only national park in New England and is said to be the nation’s second most visited national park after Yellowstone. The most popular part of Acadia is on Mt. Desert Island just outside of Victorian mansion-lined town of Bar Harbour. Admission to the park is $20 per vehicle. We drove the scenic and serene 20-mile Park Loop Road that circumnavigates the northeastern section of Mt Desert Island including a stop at the summit of Cadillac Mountain, the highest point in the park at 1530 feet. It’s a great place to pitch a tent and enjoy crisp autumn nights by a campfire. Take the Autumn Colours of New England tour and discover Boston, follow its history along the Freedom Trail. Visit Cape Cod before heading to America’s smallest State, Rhode Island. From there you’ll travel to Connecticut River Valley and the picturesque Green Mountains. Your next stop is the stunning White Mountains, continuing your journey through the Western Lakes region of Maine to Portland before returning to Boston.